Her initial education was in the Jain School Ludhiana. She also completed her B.A., BT in the colleges there. In 1963, breaking all worldly ties, with the permission of Shri Gurudevji, she took admission in Punjab University for Post Graduation. In 1965, she did her Masters in Sanskrit literature with distinction – first class first and a gold medal. Her life has been idealistic in her scholastic career throughout. 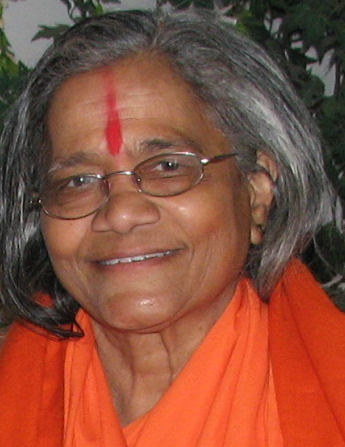 She took her Sanyaas from Reverend Gurudev at the banks of holy Ganga in 1966. Since then, she is reaching the masses carrying the divine messages of Shri Gurudevji. In 1975, on the bidding of Shri Gurudevji, for the first time, for the purpose of propagating his teachings, she toured countries like England, Canada etc. Since then, most of her time, is being spent meaningfully in reaching the holy teachings of the Eternal Religion to the common man. She speaks both in Hindi and English. Her visit to Canada and contacts with community in Kitchener proved fruitful. In October 1978, she revisited. This time, however, she persuaded Shri Gurudevji to also come. The personal charm and the learned discourses of the great Master highly impressed the community. The advent of the Brahmrishi Mission of Canada, thus dates back to October, 1978. Brahmvadini Swami Krishna Kanta Ji Maharaj has now succeeded Gurudev Brahmrishi Shri Vishvatma Bawra Ji Maharaj as the Head and spiritual director of the International Brahmrishi Mission.